Initially, Manco Capac ruled a kingdom of no more than 500 people. These people were barbarians who survived under the most primitive of conditions. Manco treated his people like brothers, and by doing this he earned their respect. One of the first things he did when he became king was to divide Cuzco into two ethnic sections. One section was called Hunan Cuzco and the other was called Hurin Cuzco. Manco united his people under one religion. He designated which gods were to be worshiped, built temples, appointed priests, and established rituals. Manco taught his people how to build irrigation systems, work in the fields, and when to sow and harvest crops. 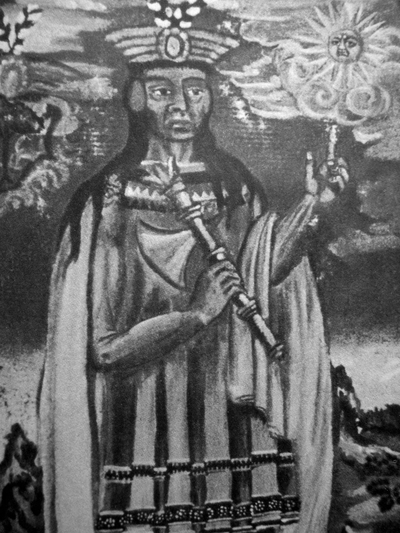 He also taught basic adobe construction techniques because the Inca fine stone construction had not yet been developed. The women were taught by (Coya)Queen Mama Huaco. She taught them how to weave and spin wool and cotton. Before long everyone wanted to live like the Inca, and people began submitting to Manco Capac'c rule just so they could enjoy the benefits. Mama Huaco and Manco Capac had one son named Cinchi Roca. From birth he was raised as the one who would succeed his father. Inca Manco Capac commanded that his most important subjects gather to celebrate his son's first hair cut. One by one the lords came forward and cut a lock of the prince's hair. Next, they left him with magnificent gifts of fine cloth, gold, and silver. At this time they were told to refer to Cinchi as the grandson of the Sun itself. During this time they danced, sang, ate, and drank. This festival became a widely accepted practice called Rutuchico. The next great festival would be held when Cinchi Roca was knighted. This was a much larger festival. Cinchi was carried in a litter and the roads were adorned with floral arches. When he arrived to his designated place, a priest made a speech. Next, the same priest presented him his royal clothing and an insignia that stated that he was successor to the throne. At this time, Manco Capac told Cinchi that he needed to marry. They searched all over the kingdom until they found the beautiful Mama Chura. This made Manco very happy. All of the future descendants of Manco were called Incas. Also, all those with direct lineage or royal blood took the name Inca.